Scheduling an appointment with an advisor has never been easier! No more calling or trying to track them down! Follow the instructions below to make an appointment with an advisor or with teaching faculty for course assistance. Step 1: Log in to “My.WCC” using Google Chrome. Step 5: Select the service category. Step 6: For Office Hours-Faculty Advisors and Project AIM-Advising, there is only one option for “Pick a Service for Your Appointment;” Student Services-1 Stop has several options. Step 7: Choose a location. Step 8: Click on available AM or PM boxes to view times available. Click on time of your choice. 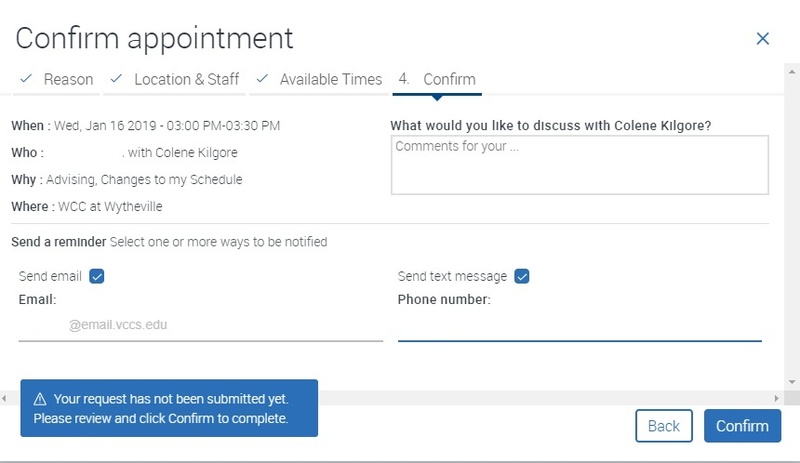 Step 9: Add comments to let your advisor know why the appointment is being scheduled. Step 10: Confirm the appointment. You and the selected advisor will receive a confirmation email.